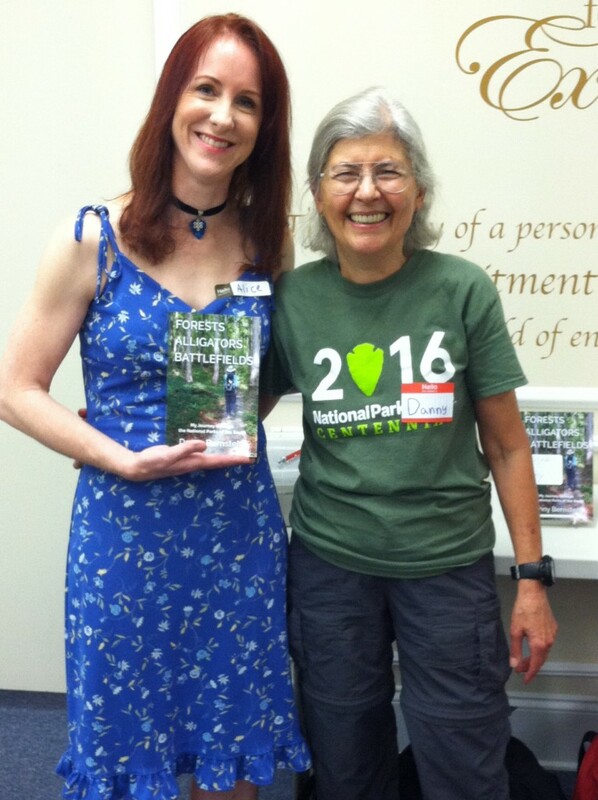 After reading Danny Bernstein’s Forests, Alligators, Battlefields: My Journey Through the National Parks of the South (or FAB, for short) you’ll want to get up from the couch, lace up those sneakers, grab a water bottle and hit a national park in your neighborhood. Yes, there are national parks all over the place and many don’t look like Yellowstone and Yosemite. Do you know that the Martin Luther King, Jr. site in Atlanta, the New Orleans Jazz site, and the Charles Pinckney site in Mt. Pleasant, South Carolina, are all national parks? I used to live off of Longview Road in Snee Farm where the Charles Pinckney site is located, but I never visited it because it’s small and not “famous.” Plus, it wasn’t touted as a “must-see” visitors’ site. This is what author Danny Bernstein is trying to change in the public’s mind—that you need to know your national parks and enjoy them—after all, as tax-paying Americans, we own these parks! She tells us to get out of our cars and walk about the parks, savoring nature and the history behind these parks, because there’s always history and history is about cause and effect, not just cold dates on a marker. Danny’s book is especially relevant this year, 2016, because it’s the 100th birthday of the National Parks Service. 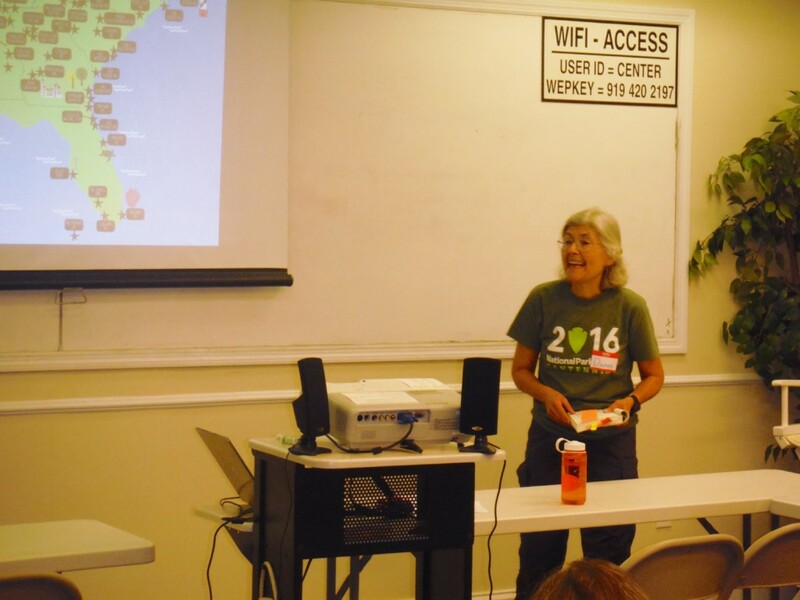 She visited 71 park units in the South to include Puerto Rico, the Virgin Islands and sites in Florida, Georgia, South Carolina, North Carolina, Tennessee, Kentucky, Alabama, Mississippi, and Louisiana. There are a lot of battlefields, swamps and visitor centers to discover. FAB made me appreciate the work of dedicated volunteers who devote hundreds, if not thousands, of hours cleaning up others’ trash, teaching schoolkids, and giving directions and so much more. In fact after reading this book, I’m checking out several volunteer opportunities—I’d love to be a historic costumed interpreter! FAB is well-organized into geographic and historical sections that give the reader historical markers. Examples include “The Europeans are Coming, “Coastal Defense,” and “Prehistoric America.” This is especially important when the same place and person comes up again, such as Dr. Samuel Mudd, who was imprisoned at (in the “Coastal Defense” chapter) Fort Jefferson at Dry Tortugas National Park for being a conspirator with John Wilkes Booth and who later was pardoned by President Andrew Johnson (in chapter “The Civil War” in the Andrew Johnson National Historic Site section). I loved Danny’s stories about people such as Billy Jones, a trail runner on the Appalachian Trail and Danny’s own experiences as a trail parent. She and her husband, Lenny, have been proud adoptive parents of 4.9 miles north of the Great Smoky Mountains National Park. Danny visited Wonderland Book Club, my book club in Raleigh, in late May to give us a multi-media presentation about FAB and her publishing journey. 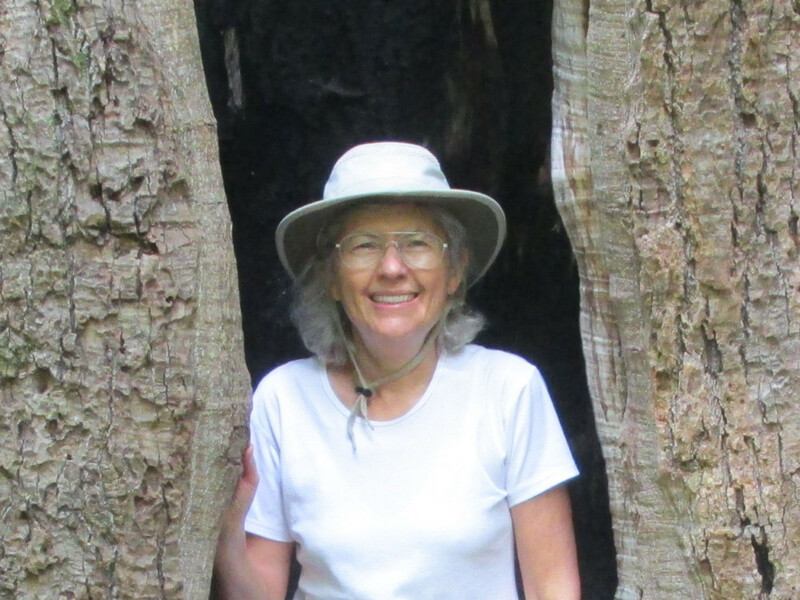 She decided to self-publish her book because that way she would have control when it would be published on the National Park Service’s centennial. Upon reading her book after her visit I was so happy to have even more information about two sites that completely drew my interest: the Andersonville National Historic Site in Georgia (“the saddest place in the South” she calls it) and the Andrew Johnson site in Greeneville, Tennessee. Johnson is still a controversial figure, but Danny made him come alive so you want to know more about this self-made man. Because I had the opportunity to hear Danny speak, I can hear her voice loud and clear in her pages. She has such a confident, intelligent and honest voice that some might think edgy. I appreciated her sharing her disappointments about certain sites when they weren’t fully staffed or when they didn’t open up on time (9 a.m. sharp!). Sometimes a ranger wouldn’t wear his/her uniform flat hat or would give a less-than-enthusiastic talk—she bared it all! Danny puts her real views and questions out there and that’s what makes this book different from other travel/nature guides. Read this book and buy one for your friend! There’s so much history captured within these pages. Did you know that many historical plaques at Vicksburg had to be melted down because of the metal shortage during WW II? Or that state legislatures were filled with Civil War veterans and that’s why they pushed for the battlefield national park sites and memorials for remembrance and national unity. So here’s your homework: get this book and then get out there! 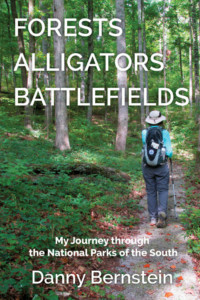 Get Forests, Alligators, Battlefields: My Journey Through the National Parks of the South from Malaprops Bookstore and from Amazon. Danny Bernstein’s mission is to get people out of their cars and walking. She’s been a committed hiker for over forty years, completing the Appalachian Trail, all the trails in Great Smoky Mountains National Park, North Carolina’s Mountains-to-Sea Trail (MST), and many other hiking challenges. Danny hikes and leads hikes for the Carolina Mountain Club, Friends of the Smokies, and other outdoor groups. 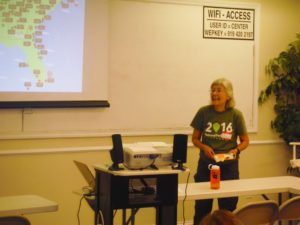 She’s written two hiking guides, Hiking the Carolina Mountains and Hiking North Carolina’s Blue Ridge Mountains, and a narrative on her MST hike, The Mountains-to-Sea Trail across North Carolina. She blogs at www.hikertohiker.com. In her previous life, she worked in computer science for thirty-five years, long before computing was cool, first as a software developer, then as a professor of computer science. Her motto is “no place is too far to walk if you have the time.” She plans to die with her boots on. We need more of that attitude! “FAB” sounds fabulous, so I purchased Danny Bernstein’s book from Amazon. Now I wish I had included her talks in my workshop selections at the NC Writer’s Network 2015 Fall Conference in Asheville and caught her at Wonderland Book Club. My summer vacation in June featured the historic sites on the NC Outer Banks: theater, gardens, ferries, wild horses, a Life Saving site museum, plus of course the magnificent lighthouses overseen by the National Park Service. Every ranger we met was helpful, informative, friendly, and interesting. The OBX scenery alone is compelling, and those items mentioned are special places in our North Carolina backyard worthy of visits no matter the location in which you live. 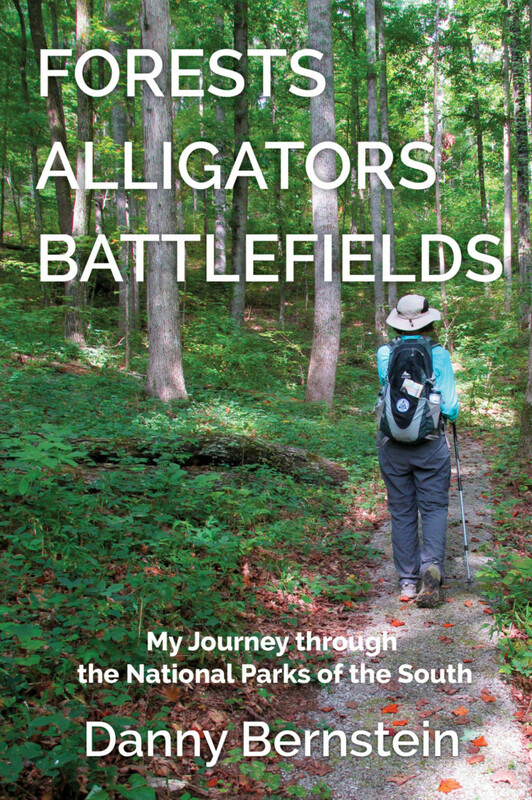 Thanks for sharing your insights into “Forests, Alligators, Battlefields, … “. It’s my pleasure, Doug! You made my day with your post, re: my book review about Danny’s book helped you purchase it! Yay! You’ll really enjoy it! My son just returned from OBX and I’m jealous–all of that amazing history!